It’s been a week since I’ve written. It’s not because I’m lazy, I promise. So much to say, and this three-hour plane ride from Houston to Newark is the perfect time to get it all down. Especially since Captain Hilarity, the funniest flight attendant in the skies comically inspires me. He started with something about those in the exit rows who just don’t give a function and ended with calling attention to a woman standing holding up 145 other passengers. Ah, the little laughs get me every time. His name is tree hugging, Earth-loving, environmental lawyer and I met him in an airport in New York a couple months ago. I really love airports apparently. Really nice, Austin-born gentleman found me on LinkedIn and we’ve exchanged a few emails. Basically, if you ever make it to Austin, let’s grab a drink. So, he picked me up at my hotel and in the warm dusk of night we had a drink (outside!) 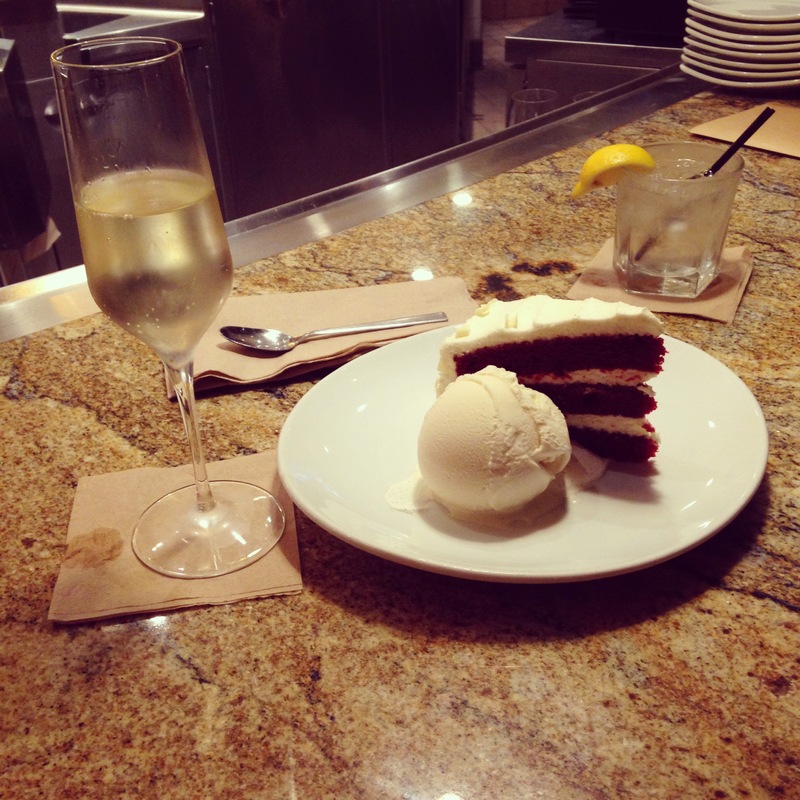 and some wonderful dinner and then we shared a gigantic piece of red velvet cake. I’m in love. Seriously. It was the best cake I’ve ever had (and you thought I was going to say something else). With early agency meetings, it was an early night and with a quick kiss on the cheek I bid my cowboy adieu. WEDNESDAY: The agency lies in the Hill Country part of town and as I drove (like a grandma) up the multi-lane highway I saw monstrous mansions aligning the tops of the cliffs overlooking the city of Austin. Maybe one day I’ll get to see the view from up there. I bet it is stunning, you know being God’s country and all. Walking into a new potential job is a little like walking into high school for the first time. You’re the no-named new guy. I did feel like that. Until I actually made it down the hall and immediately saw the chalk board wall full of song requests, a couple of turn tables, a shelving unit full or DJ equipment and records and music festival and band posters lining every inch of space. As a music lover, nothing makes me feel more at ease than a real life soundtrack. From there, it just got better. After a couple of meetings with directors, CMOs, fellow writers and persons of all advertising walks of life, I was done. Part 2 of my day consisted of meeting with my agency-appointed broker, Steve. Steve is awesome and his apartment locating services are free. Remember, I don’t have an offer, so telling Steve my budget is a little like a guessing game. I have ZERO idea what a salary offer would be, so I gave him a range. Steve: Are you serious? That’s everything in Austin. I have 11,000 listings. Me: I’m leaving Thursday, ain’t nobody got time for that. Steve: OK, what are you looking for? What’s a deal breaker. Me: Washer, Dryer, Pool, Gym, Updated kitchen, Dishwasher, Hardwood Floors, Carpeted Bedroom, Walk-in-Closet, Hot Single Neighbors. Believe it or not, this man found me an apartment with EVERYTHING I asked for in all ranges of budget. A 1980s gem for $850, a brand spanking new resort NEXT DOOR to “my office” for $1050 and the well-known, cosmopolitan apartments known as The Domain for $1225. Every single one of them could have fit my full-sized bed I kept in my tiny one-room apartment in the wardrobe. I’m in renter’s heaven—700-800 square foot bachelorette pads just waiting for me. Oh, and did I mention the security deposits in Austin are around $150. I’m not kidding. You don’t need first and last month + 1 month security. I had to fork over almost 4 grand for my UES joint. I can get one of these for a $45 application fee and a smile. Alas, no job, no apartment. I left Steve. Feeling confused, longing for an offer and went back to the hotel. Thursday: Lunch date with a couple of the folks over at the agency. We had a great time, talked, and got to know each other. But, what was it all for? Where was the offer? Would there be an offer? With a trip to LA approaching in less than 48 hours I was determined to know what was next. I got my answers in the Austin airport an hour later. My contact and future boss called me to offer me the job! With a brief discussion about the logistics we both agreed that after two months we were happily committing to employee/employer. So, here I am, 42 days after being let go from a special hell, solo celebrating with a G&T on my flight back to the northeast for the last time until TBD. Unemployed no longer starting TBD. I feel great. I feel more than great. I’m elated. I’m going to say goodbye to my spectacularly supportive parents and head out into the great (un)known. Maybe I’ll even stop in Tennessee, but that’s another story.